"Building a swimming pool is simple. Building your dreams in the backyard is memorable!" Our team of highly qualified and experienced pool design consultants possesses the highest quality abilities, workmanship, construction knowledge, ethics and customer service. We truly set ourselves apart from the competition with our quality and professionalis. Our testimonials alone illustrate how much we care about you as a customer and the outcome of our designs. 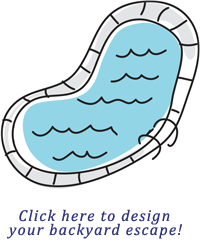 Our pool building process is simple. Our consultants will meet with you and the family face-to-face to understand your expectations. If you are unsure, the designers will guide you through recommendations or working pool models in 3-D color. Regardless of the task, they are there to capture your dream!!! Once we have the new pool design, we go to work! 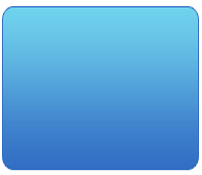 Our onsite superintendent and experienced workforce begin constructing your swimming pool directly from the permit-approved drawings. Rest assured, we will be committed to delivering on-time and withing budget with all awareness for quality, safety and customer service. Once the major pool construction phases are completed, our certified maintenance team will start and monitor the caring process. They will provide instruction on how to operate, maintain and care for your new investment. If needed, our Pool Service and Repair technicians are well-qualified and are warranty representatives for every brand we install. At the end, we promise to be there for you for years to come...it costs nothing to call and ask us for advice. 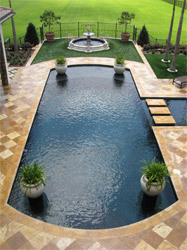 If your lifestyle demands more assistance, we can provide extended services to maintain and service your swimming pool. 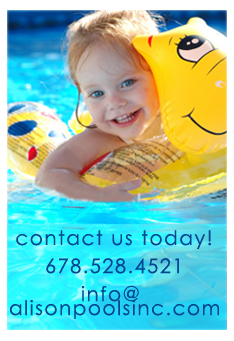 Click here to request a onsite new pool design and construction quote!